ACTIVITY 26: Quickly read the article below and choose the most appropriate title from the menu. Then check the correct answer. Don't worry if there are some words you don't know: you should be able to get the general idea without needing to use your dictionary. In ancient times, ices of any kind were pretty unusual (except in winter). In about the 3rd century BC, the Chinese realised they could store blocks of frozen river water underground until summer. The practice gradually spread to the west, and it allowed iced desserts to be regularly served in royal palaces. The ancient Romans even managed to make a deep-freeze in the North African desert: a tub of water was set in the bottom of a deep hole, and exposed each night to the clear skies above. Heat radiated freely away until just before dawn, when thick layers of straw were placed on top to act as insulation. In a few days, Roman cooks had a block of ice to play with. Such skills were lost after the collapse of the Roman Empire, and ices remained a product of the fabled East. In the Middle Ages, the Christian Crusaders greatly appreciated them, when they were not busy attacking the Muslims in Palestine, and in time iced sherbets spread from Arab courts to Sicily and on to Renaissance Italy. (The Venetian explorer Marco Polo is said to have brought recipes for frozen milk desserts back from the Far East in 1295.) Catherine de Medici - or her Florentine cooks - took the tradition to the court of France in the mid-16th century. Charles II picked up the idea when in exile in France, and after his return in 1660 gave England its first ice house. But Britain's first true ice cream was eaten at Windsor in 1677. It probably contained much coarser crystals than we are used to today. 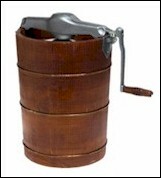 The ice cream churn was invented by an American, Nancy Johnson, in 1846. The first ice cream factory opened in Baltimore, Maryland, in 1851. 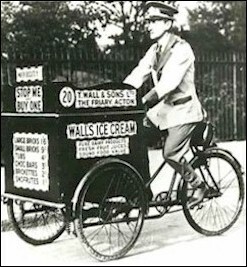 But the popularity of ice cream might not have spread without Italo Marchiony, who arrived in Hoboken, New Jersey from Italy in 1895 and sold ice cream and lemon ice from a pushcart on New York's Wall Street. He used liquor glasses to serve his confections to stockbrokers and Wall Street runners. But many of the glasses broke or were taken and had to be washed after each serving. Marchiony devised a better way to serve ice cream: an edible cup known today as the ice cream cone. The hand-powered ice cream churn has scarcely changed since its invention 150 years ago. A metal container sits inside a wooden tub; the space between them is packed with ice and salt, and the inside container filled with the chosen ingredients. As the paddles rotate, they prevent large ice crystals forming. Just clamp on the top and turn the handle. In a few minutes you'll be in the real ice cream business. SORBETS OR SHERBETS: made like water ices, but with an egg-white stirred in after freezing to give a soft-scoop texture. ACTIVITY 27: Finally, find the answers to these questions reading carefully the text once again and choosing the answers from the menus (two answers are NOT correct). Then check your exercise. first developed the practice of storing ice underground? helped to spread the use of iced desserts from Arab courts to Renaissance Italy? designed a machine that could make ice cream in a few minutes? to the 20th century public?